Soft inner cotton lining wicks away moisture from skin, triple-layer polyester pad absorbs liquids. 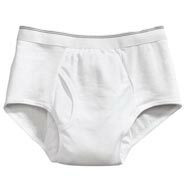 Antimicrobial fibers of incontinence briefs eliminate odors. Waterproof vinyl barrier prevents leaks. Men’s 5 oz. capacity brief has absorbent, 5-layer construction. Cotton, polyester knit and nylon; all machine washable; USA/Imported. 1 pair. something I need, cannot find anywhere. Because they work for my adult special needs son. This is being purchased for a gentleman who has slight leakage following prostate surgery. After looking at all available items .. and then reading reviews written by previous users ... this seemed to be my best choice. Its the color I want and the padding is on the correct side. I am first time user of this type product. I like the appearance and the stated quality. Also the fact that it can be washed and reused. All things considered the cost seems very reasonable. Will let you know if product meets my needs. I wanted something for my son to try and see if these could work for him! Fingers crossed that they do the trick! is there a large sizer is xl the next size to medium ? Should this item, men's 5 oz. Brief shorts (incontinence) be washed alone, or can it be thrown into the general machine wash?? BEST ANSWER: Thank you for your question. We would recommend washing them alone. We hope this information will be of help to you.